Access your default settings from the Settings icon on the right toolbar. Click on the Settings icon on the left to see what unit of measurement your album is in. If you need to change this, click on the Album size icon. The unit of measurement can be changed in the Wizard. You have the choice of Inches, Millimeters and Pixels. Be sure to click OK then SAVE after making any changes or your settings will not be saved. For all Fundy Direct labs and some of the larger labs, we have the cut line and safe zones encoded. For all other labs, we set a default (Cut Line 1/8") and (Safe Zone 1/2"). These settings are required and if you have any doubt of what these settings should be, contact your album company for precise specifications. 1) Cut Line is the area that may be cut or trimmed at the lab after the spread is printed. Unless you take your photo all the way to the edge of the spread (called a bleed), you should try to keep anything important out of this area. 2) Safe Zone is the area of your spread that is safe from being cut or trimmed by the lab. Anything inside this area is safe from being cut off in the final print. White space is your friend! 3) Auto Design Buffer is how Album Builder sets the distance between the edge of the cut line and the safe zone when applying auto designs. You have total control over this. It's basically the distance between your images and the edge of the page AFTER the album is cut. *If you want to design directly onto the Safe Zone lines, you can subtract the Safe Zone value from the Cut Zone value and use this as your Auto Design Buffer setting. 4) Image Spacing is the default image spacing within drop zones. 5) Stroke Width is the default stroke width and color around all your images. 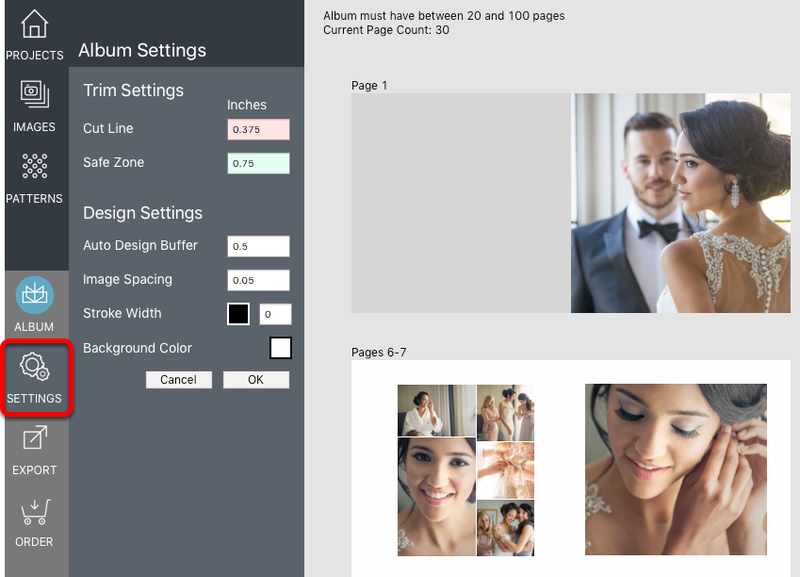 6) Background Color is the default color of the background in your album spreads. Once your changes have been made, click OK to save the changes. These Settings will be applied globally, but you can still adjust them in each spread for even further customization. Note: Global changes to stroke or background color do not affect spreads or Drop Zones that have their own stroke or background colors applied.